Home › Exercises › Massage Chairs versus Masseuses. The last few decades have seen many technological breakthroughs that have changed the way we entertain ourselves, the way we relax and the way we work. But while we might have always suspected that work would have been made easier by technology, the idea that we would one day be able to get a massage at home for hours thanks to our gadgets is one that is a little more surprising. But that’s precisely what a massage chair provides – a simple mechanism that can massage your joints and muscles using rotating mechanical parts and heated pads in order to help you relax and get all those knots out of you that could otherwise prove damaging to your health. But how does a massage chair or cover compare to an actual masseuse? Of course a massage chair has some notable advantages over a real masseuse. For one, it’s always there which means that you can get a massage from it after a hard day at work without actually having to go anywhere. At the same time, a massage chair can provide you with a back rub that lasts an infinite amount of time – it will never get tired fingers, and when all is said and done it won’t ask for a massage back in return either. On the downside though a massage chair is going to be limited in what it can perform. For one, a massage chair can’t react to its patient, so it won’t be able to tell if you have a knot and then work extra hard to work it out of you for instance. Likewise a massage chair won’t be able to respond to requests. That said, some massage chairs these days to allow you to control them using a remote, which allows you to focus on specific areas and use your favourite motions on them – but you will still be limited to a set number of positions and treatments. Another downside of the massage chair is that it can’t get it’s ‘fingers’ into your muscle as deeply in order to really release tension and stress. You will get a number of circular pads and perhaps some patting, but nothing that really squeezes the tension from your muscles or gets underneath your shoulder blades. 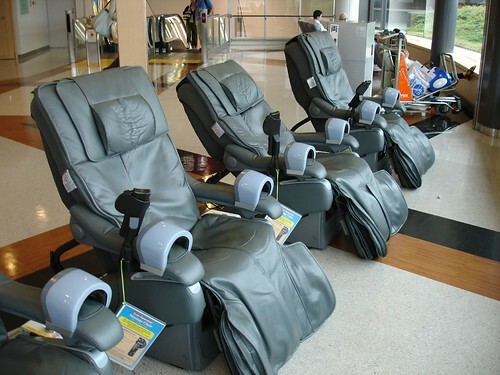 Some massage chairs in fact can end up causing more harm than good. While most are well designed, some can prove to be a little too rough and if you sit on them in the wrong position then they’ll have no qualms about furiously rubbing into your spinal column. The amount you pay for your massage chair and the way you use it will have a big impact here, but at any rate you do need to be careful. Of course a massage chair can’t use oils either, so good though they are, they won’t quite replace a real massage therapist just yet! The author of this post is Jenny Wadlow, a freelance blogger who writes on an array of health and wellness topics online. She writes articles for Bodysite Builder, one of the best physical therapy websites. Jenny is an avid soccer fan and enjoys going to the games with her buddies.